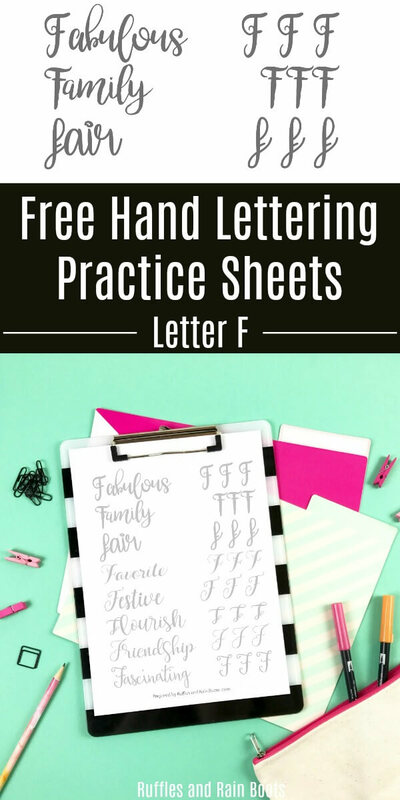 This set of free uppercase letter F hand lettering practice sheets will help you develop 8 different styles in brush lettering, bounce lettering, and modern calligraphy. We are already at letter F, can you believe it?! If you’re just joining us now, don’t worry. To get all of the previously released uppercase letters, sign up for the once-weekly emails. You will get access to the members-only lettering section of the site and you’ll be notified when we release new sets. Sign up to the Ruffles and Rain Boots once-weekly email here. Both small pen and large pen practice are included in the 8 different styles in this set. I like to use different techniques to expand my practice and I built this set to help me work on these 8 styles. I had no idea they would be so popular with everyone! If you’re like me and you hate waiting, you can get the entire uppercase lettering AND the lowercase lettering sets now! Both sets include 8 lettering styles in brush, bounce, and modern hand lettering styles for large and small pen practice. 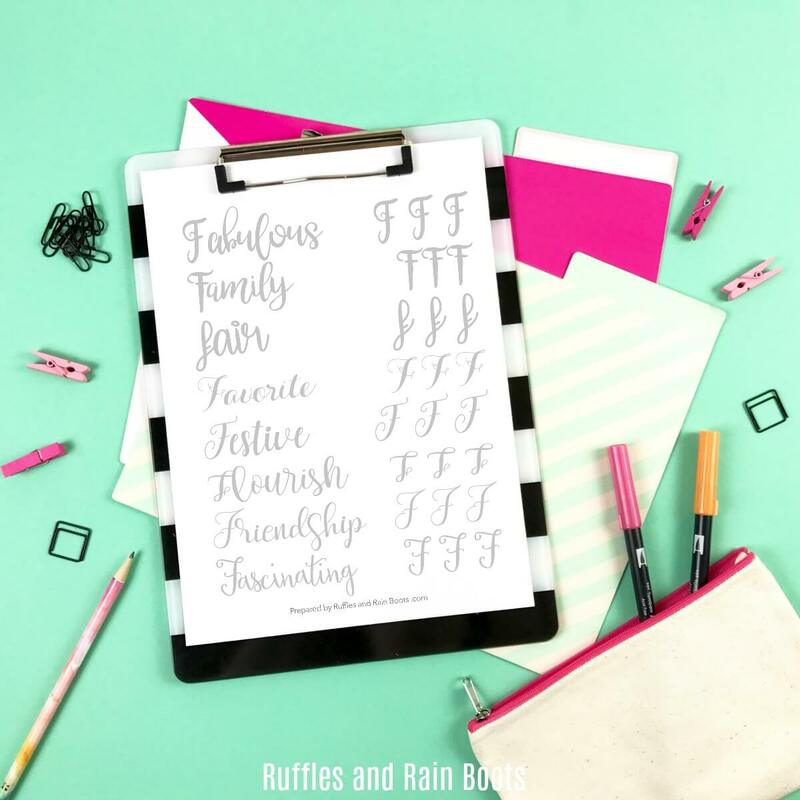 Psst: if you sign up to the Ruffles and Rain Boots newsletter, you’ll even get a coupon! If you’re like me, you love testing new pens and brushes. Here is what I use for these sets. Did you know I have an Amazon shop with my FAVORITE lettering supplies? Because friends don’t let friends use crappy supplies. 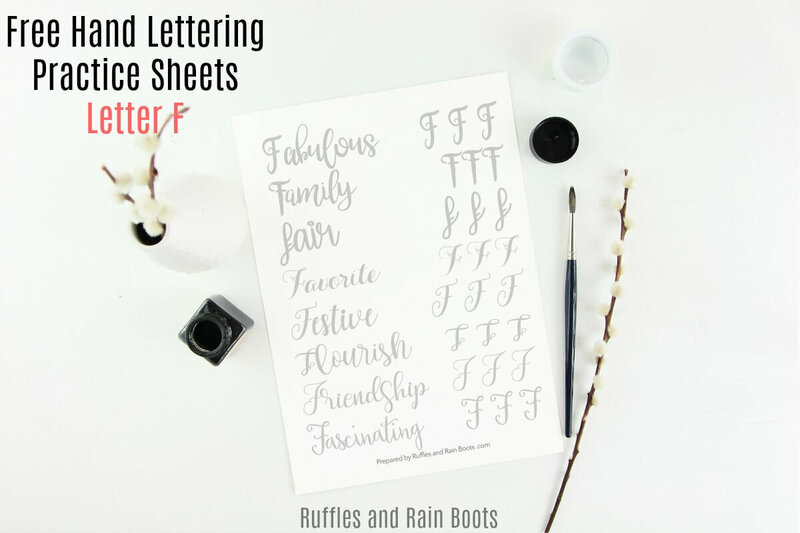 If you’re ready to download the letter F hand lettering practice sheets, grab your password and head over to the private Hand Lettering workbook page here on Ruffles. Note: if you don’t have a password, you’ll receive it upon signing up for the Ruffles and Rain Boots newsletter.